Incredible Views Bordering national forest! This is a beautiful artistic home in a natural outdoor playground. 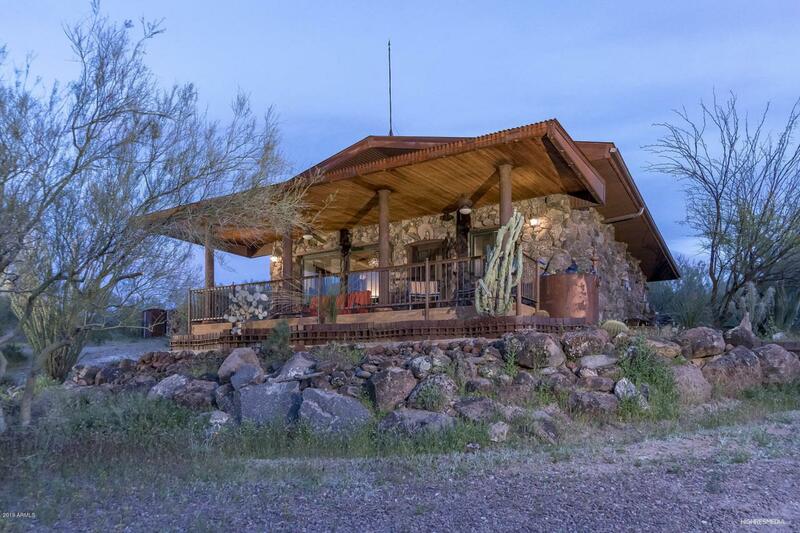 Have your own gateway to adventure activities in the Tonto National Forest and enjoy the restful quietness from the 10' porch strategically positioned for Sunrise and Sunset with no homes in sight. World known Artist hand built and designed this retreat and with Vintage reclaimed wood doors ceilings & hardware. Scored & stained concrete floors, granite counters, plaster walls pigmented from natural desert earth. Antique accents; decadent colored glasswork. Dual pane windows; A/C heat pump/evap. Venmar Air Recycling. Private well! Radiant heat floors in all buildings.